C1q nephropathy is an immune complex glomerulonephritis, first described in 1985, characterized by the mesangial deposition of C1q as the dominant or co-dominant immunoglobulin. The exclusion criteria include type 1 membranoproliferative glomerulonephritis and clinical or serological features of lupus nephritis. We would like to report a 25-year-old girl who presented to a district hospital with fever of one day duration without any localization. After two days, she developed vomiting and passed cola-colored urine. There were no complaints of pain in the abdomen, blood in stools, or oliguria. Her blood pressure (BP) was 160/110 mmHg. Investigations revealed proteinuria of 2+, microscopic hematuria and serum creatinine of 1.2 mg/dL. She was treated with oral antibiotics, angiotensin receptor blocker and bed rest. She improved with that treatment and remained asymptomatic for a week. After a week, she developed low-grade fever, throat pain and cola-colored urine, which brought her to our tertiary hospital and she got admitted. She denied history of jaundice, blee-ding tendency and dysuria. She did not have a skin rash, oral ulcers, alopecia, or joint swel-lings. On examination, she was afebrile, her BP was 120/80 (on losartan 50 mg once a day) and had mild pedal edema. The past medical history and family history were unremarkable. Throat examination revealed congestion of pharynx without any tonsillar abscess. On ab-dominal examination, no organomegaly or masses were appreciated. The rectal examination revealed hemorrhoids, but the stool examination was negative. The rest of the systemic examination was normal. Urinalysis revealed proteinuria (3+), 2-5 white blood cells per high-power field (hpf), numerous dysmorphic RBCs per hpf, and RBC casts. The 24-h proteinuria was 4.8 g. Her serum creatinine was 1.1 mg/dL, blood urea 44 mg/dL, albumin 4.0 g/dL, cholesterol 190 mg/ dL, hemoglobin 10.9 g/dL, white cell count 5,900/mm 3 , and platelet count was 250,000/ mm 3 . Serological evaluation showed an anti-streptolysin O (ASO) titer of <200 IU (normal), C3 112 mg/dL; and negative titers for antinuclear antibody, anti-dsDNA, antineutrophil cytoplasmic antibodies (ANCA) and cryoglobulins. Tests for human immunodeficiency virus (HIV), hepatitis B and C viruses were negative. Renal ultrasonography showed normal-sized, echogenic kidneys with maintained corticomedullary differrentiation. On day 5 after admission, she underwent a percutaneous kidney biopsy. The biopsy had 12 glomeruli; all showed mesangial proliferation. The glomerular basement membrane was normal. The interstitium and blood vessels were unremarkable [Figure 1]. Immunofluorescence (IF) examination showed dominant mesangial immune deposits of C1q [Figure 2] along with focal IgG and IgM deposit. No IgA deposits were seen. The biopsy findings were consistent with the diagnosis of C1q nephropathy. She was started on Tab Prednisolone 50 mg/day. 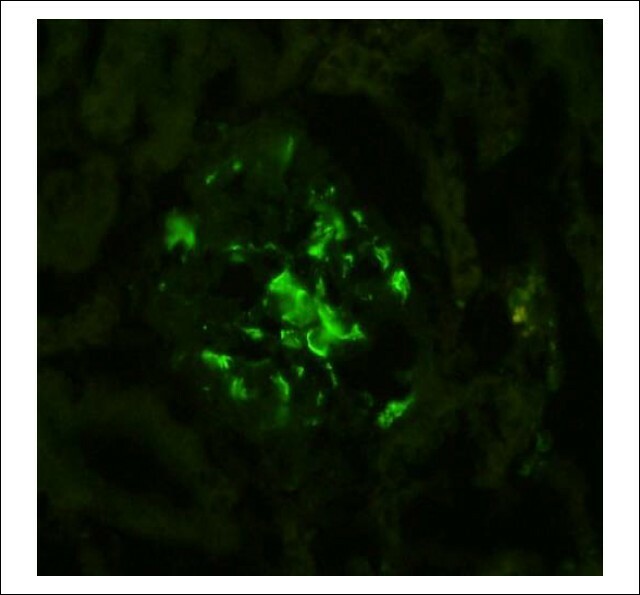 Figure 2: Immunofluorescence examination showing mesangial deposits of C1q. 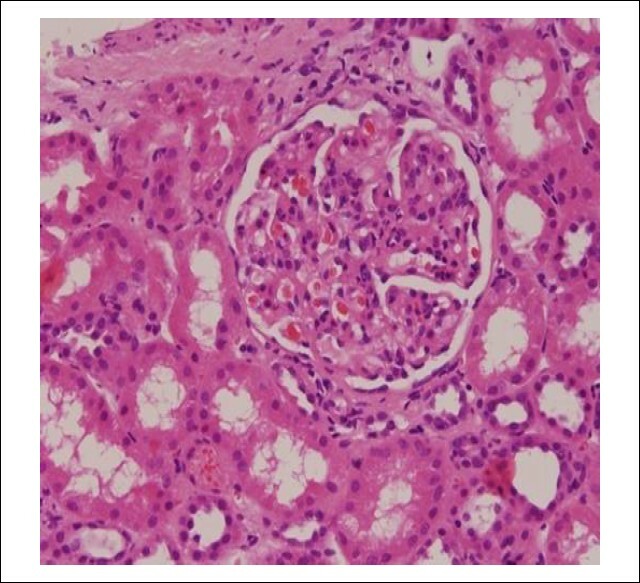 Our case highlights the variable presentation of C1q nephropathy. We suggest that C1q nephropathy should be considered in the differential diagnosis of recurrent hematuria with nephrotic range proteinuria, particularly in young adults. 1. Jennette JC, Hipp CG. Immunohistopathologic evaluation of C1q in 800 renal biopsy specimens. Am J Clin Pathol 1985;83:415-20. 2. Markowitz GS, Schwimmer JA, Stokes MB, et al. C1q nephropathy: A variant of focal segmental glomerulosclerosis. Kidney Int 2003; 64:1232-40. 3. Hisano S, Fukuma Y, Segawa Y, et al. Clinico pathologic correlation and outcome of C1q nephropathy. Clin J Am Soc Nephrol 2008;3: 1637-43. 4. Vizjak A, Ferluga D, Rozic M, et al. Pathology, clinical presentations, and outcomes of C1q nephropathy. J Am Soc Nephrol 2008; 19:2237-44. 5. Jennette JC, Wilkman AS, Hogan SL, Falk RJ. Clinical and pathologic features of C1q nephropathy (C1qN). J Am Soc Nephrol 1993;4:681. 6. Mii A, Shimuzu A, Masuda Y, et al. Current status and issues of C1q nephropathy. Clin Exp Nephrol 2009;13:263-74. 7. Wong CS, Fink CA, Baechle J, Harris AA, Staples AO, Brandt JR. C1q nephropathy and minimal change nephrotic syndrome. Pediat Nephrol 2009;24:761-7.